I have been applying the Vitamin C serum every day and night. When needed I was able to apply this under my makeup routine.The serum comes in a dark bottle with an easy to use applicator. less is more when applying the serum and it spreads out nicely. I have acne/oily skin and very highly sensitive. I saw a reduction of acne while using the serum and I found that my face was less oily. the solution didn't clog my pores at all. I have freckles and red cheeks that I'm hoping to brighten. I love that this product has sun protection as its so easy to forget to apply protection all over.The serum is vegan-friendly. Natural products work best with my sensitive skin. Vitamin C facial serum has been said to provide antioxidant protection, reduction of sunburn cells. Prevention of free radicals in the sun-exposed skin. Fades sun spots and discolouration refines skin texture and reduces wrinkle formation. The product can be used as a step against wrinkles. Yalmeh suggested direction of use: Wash and pat dry skin. If using a toner, apply the toner before serum, apply a thin layer. Use a good moisturizer immediately afterward. Apply a small amount to entire face and neck, allow to dry. I received this product in exchange for a honest opinion. Oh my gosh, I love using products that have Vitamin C in it - and wham bam double doseage of goodness if it's in a serum form too. I find it super hydrating on the skin (seurms) and then the Vitamin C has such a lovely brightening effect to the skin, if you continue the usage of it, especially for a few months. I have dry skin too, but mine is naturally dry (not sure if yours is) so I need to always apply a serum before my moisturizer. I'm always looking for skin care products that even skin tone (and anti aging is always a plus! ), and this sounds great. I'm like you, though, and hate the feeling of dry skin! The tightness is really uncomfortable. I'll give the Yalmeh Vitamin C a shot! Vitamin C is my favorite on my face. It helps so much with my slight acne, shrinks larger pores on my face and gets rid of all excess oils. 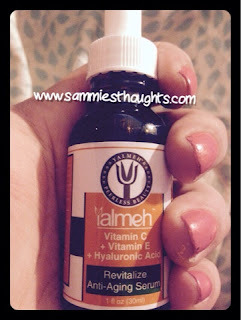 I have tried a few different products from Yalmeh. It was anti aging. They make great products. Will have to try their Vitamin C.
What a great review! I have been hearing a lot about this product lately and wondered if it really worked! I will be checking it out soon as any product that can help my skin, I am will to try at least once! Thanks for highlighting this today! After reading your post, I realize that I need to add vitamin c serum to my beauty routine. I don't really use serum. I usually just clean my face, and then use moisturizer. I notice that I start getting sun spots around my cheeks. I definitely should try Yalmeh Vitamin C serum. Thanks for sharing! I have heard about vitamin C serum but I have never had the opportunity to actually try it. This looks like a great product for my trouble skin. Thanks for sharing this great product. I've been using a Vitamin C serum for a few months now. It really worked at brightening my dark spots. This is the first time I heard of this brand, but I would love to try this. I definitely have to get some of this Yalmeh. 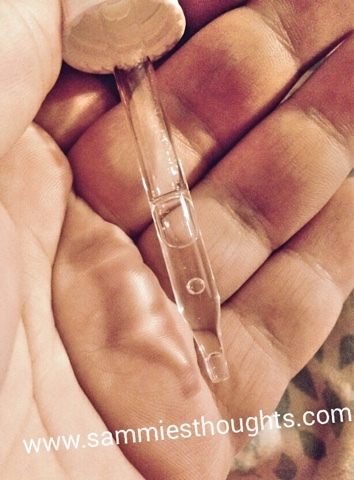 I love serums because they absorb so readily, and vitamin C is fantastic for the skin. Thanks so much for sharing this! I have acne and oily prone skin as well! It's interesting that an oil could assist with skin that's already oily. I have tried almost everything and at 36 years old I still get blemishes. I will definitely look into this ! I have heard a lot about how good Vitamin C serum can be for you skin! This sounds like it had some good results for you skin over all. My skin has become higher maintenance over the years, I need to look into getting some of this. I'm a big fan of vitamin c serums myself and always use on the morning. My fave are Skinceuticals and also Cosmetic Skin Solutions. There are so many nowadays available on the market it can be hard to choose one.